I should be happy right now. E, diagnosed last June with Crohn’s Disease, is doing much better. She has had few bouts of stomach pain the last few months and we’ve been able to reduce her meds from seven to one. Her latest test results show she’s bounced back from her bad flare-up last year and the inflammation numbers are much lower. All good news. 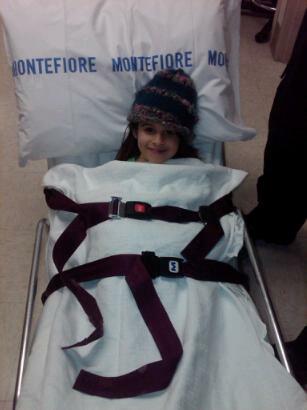 In many ways, I’m thankful for how attentively her pediatric GI has handled her case. They are thorough and scientific in their approach, and have looked at everything from inflammation numbers to liver toxicity to vitamin D levels, ensuring nothing is overlooked. In the past eight months, E has had a colonoscopy, endoscopy, CT scan, hand scan to determine her growth rate (because of the steroids she was given in her early treatment for ITP, and because she’s small, there was concern that her growth may have been stunted; luckily, it hasn’t), bone density hip scan (steroids can also cause osteoporosis; negative), MRI, sonogram (to determine if pancreatitis was developing from one of her meds; also negative), and numerous, sometimes weekly blood and poop tests. We have a clear sense from all of this of her progress, which has, by all accounts and test results, dramatically improved. The fact that she’s been amazingly resilient through all of this, too, has only increased my admiration for her. It gives me comfort knowing this resilience will carry her though other life challenges, and I’m grateful she’s got it in spades. So I should be happy. But as her caregiver and the one who makes the decisions, I’m finding myself at a crossroads between what the doctors now want—another colonoscopy–and what my intuition says is best for E right now. Medically speaking, I have no right to question these doctors. When I vented to her hematologist, Dr. B (who is like a god to me, he got her off steroids and, eventually, got her ITP into remission) about all the tests she’s been given, he gushed at how thorough her GI doctor was, what a good job she’d done managing E’s Crohn’s to get her to this point. He thought E looked “better than I’ve ever seen her” and told us to come back in six months, the longest stretch we’ve gone so far between visits. From a case management perspective, the docs are doing their job, and doing it well. But E is not a case. She’s a nine-year old kid who just wants to be healthy and go to school, play with her friends, sing, draw, ice skate, maybe even go to sleep-away camp this summer. She’s been scoped and poked and prodded and asked to drink disgusting, foreign fluids until she threw up. She’s been scanned up and down and sideways, and put into a large, loud, claustrophobic machine and told not to move for an hour (she did better than most adults, the technician said). She’s been needled and she’s pooped into plastic containers. And she’s handled it all with grace, charming every medical professional along the way with her can-do attitude and appreciation for their help. But now, the prospect of another scope is stopping me cold. The irony was not lost on me. Here’s the thing, docs: The Whole Child is not a case. She’s a child who needs a break from these tests, to start to feel normal again. She’s a child who has two autoimmune disorders. They know remarkably little about the triggers for these types of diseases, but they do know that stress is a factor. They just don’t fully know how much of a factor it is. My guess is, it’s a leading cause. And the scope last year—the 30 hours of prep, and then the after effects that brought us to the ER the next night to make sure there weren’t complications—was the most stressful of all of it. The doctor says this one won’t be as bad, because she’s not in the middle of a flare-up. The doctor says after this one, she won’t need another for 2-3 years. But given that they seem to love testing, what if she has another flare-up between now and then? Can I be assured that they won’t ask for another scope then? And more importantly, what does the Whole Child want? Will I just go along with it out of blind trust that doctors know more than I do—a bias grilled into me by my father, a doctor, and the memory of my grandfather, also a doctor? After all, I’m just her mom. I didn’t go to medical school. Or will I say no, the prospect of more stress would be deleterious to her condition, a.k.a., not worth the additional data they’d glean from it? I need to call the doctor to talk it over. But instead, for the past few weeks I’ve found myself sitting on the fence stressing her stress—and mine—and avoiding the conversation. Today I will make the call. “Squeeze my hand if you’re scared,” E tells me. It is 5am and we are huddled together in bed, braving a violent thunderstorm. Terrified since lightning struck our home a few years before, I was trying to give comfort to her, my seven-year-old little dynamo. But she called me on it. She knew: I was probably more scared than she was. One day I will learn whether she felt my fear about her illness much the same way, whether she saw through the brave face and semi-calm demeanor. It was a Saturday night, one year ago exactly–December 5, 2009–that E was diagnosed with ITP, a rare blood disorder in which her body’s antibodies kill off its platelets. Two days shy of Pearl Harbor Day, this was our own version of a day ‘that will live in infamy’ . . . the day that changed everything. That morning, she woke up again with a bloody nose. This happened the night before, but it wasn’t excessive, not witnessing any other symptoms, I chalked it up to the dry heat. But on this morning, there was some dried blood on her pillow and her legs had several bruises with tiny pink dots surrounding them. And the sore on her lip–I assumed it was a chapped lip aggravated by biting, which she often did–seemed to have mushroomed overnight. No temperature, though, and she swore she felt just fine. She was aching to get to her karate testing that day to get her yellow belt. I agreed, but told her we would need to go to the doctor immediately afterward. Once at the testing, another clue emerged. My little firecracker, so intent on getting to yellow, was positively phoning it in. She had zero energy, was barely able to complete any of the moves. I turned to B, my boyfriend (more on B later) and said, “Look at her. I’m worried.” He agreed. This wasn’t like her at all. At the after-care facility later that afternoon, the doctor couldn’t tell me what it was, but told me I needed to get to the closest hospital’s ER for blood work immediately. I asked him what the worst-case scenario was. He said, “meningitis.” Gulp. We left quickly. The snow that had started to fall earlier was starting to stick; visibility was poor. I am still unsure, given my sky-high anxiety and the poor road conditions, how I got us to the ER–a good 15 minutes away–safely. It was one of those out-of-body experiences where you just autopilot it, I guess. The ER at Vassar was quick and professional. They got us in right away. Once the doctor came in, I asked them the same question about worst-case scenarios. This time, the reply was, “ITP.” It took four nurses to hold E down for the blood test. (We later joked that she got her yellow belt that morning and got to use it that evening.) Forty-five minutes later, with a platelet count of 3,000 (normal range is 150,000 to 400,000), the doctor confirmed that she did, in fact, have ITP and required immediate attention. An ambulance was on its way to take us down to Westchester Medical, where they had the specialists and a bed ready for E to receive treatment. That was last December. Since then, we’ve logged in dozens of trips to the ER and overnights at the hospital, nail-biting moments awaiting results. On our second trip back–a little over a week after we were released–she was given a bone marrow test to make sure it wasn’t leukemia. But the doctor–a star but not a procedure guy–failed to give me the beeper to alert me when she was done, so what should have been a 15-minute wait went nearly an hour as they tried to locate me (umm . . . I was in the waiting room.) I was terrified that something happened to her, but when they finally did find me, the news was good: There was no evidence of cancer. It was definitely ITP. We celebrated several of the major holidays–New Years, her birthday–in the hospital. As the months went by and our trips became more commonplace, I learned who to trust and who needed to be managed. Above-and-beyond nurses helped us as we endured more than one apathetic resident and waited for the doctor’s daily rounds to hear our fate. Were we getting out that afternoon? Or one more night? What next? By early spring, it became clear that hers was a particularly bad case and needed more specialized care than the doctors at Westchester could give her. We defected to the top ITP doctor in New York City, a specialist who had experience using the latest treatments out of the biotech industry. The promise of better managing E’s condition and getting her off the steroids/IVIG bandwagon and avoiding a splenectomy, which one particularly hard-core doctor was advocating. But a spleen is not a vestigial organ, so the promise of this new treatment–called N Plate–offered new hope. I was game. We struggled through the spring and half of the summer until the new treatment finally started working. I had to give up work for months to be there for her, a big sacrifice both professionally and financially. (My mom stepped in to help financially. Otherwise I honestly don’t know what we would have done.) In the spring, I was diagnosed with depression. Reluctantly, I went on medication for three and a half months, enduring the side effects to get me out of the fog and get clear-headed again. No matter what, I made sure that every day, we found something to laugh about together. If I couldn’t fix her physically, I could use all my mommy muscle to keep her spirits up. On the good days, I planned play dates and activities so she always had something to look forward to. It wasn’t hard: We have been blessed to have such a strong and loving network of friends and family who made themselves available to us and went out of their way to help out. Hillary was right: It really does take a village. Sometimes you don’t know it, though, until you need all the villagers. If there is a silver lining to having a child with a life-threatening illness, the biggest comfort has been that this has been a shared journey. As parents, we all want our children to know that we are there for them, physically, emotionally, spiritually. Children take comfort in the knowledge that we would do anything for them if the need presented itself. ITP allowed me to demonstrate to E that I would put my life aside to take care of her. She knows I have her back. As I write, we are not out of the woods yet, but our lives have vastly improved. She is stable enough that our once-weekly hospital visits are now monthly; the at-home nurse administers E’s shot in the intermittent weeks. Getting our time back has meant a return to a mostly normal life for both of us–school and activities for her, freelance work (and the job of getting more freelance work) for me. My biggest hope is that someday soon they will tell us she has fully recovered. And while we’re not there yet, today didn’t just mark E’s one-year anniversary with ITP. It was also the day she got her orange belt. And did so with gusto. NOTES ON HER ILLNESS: In children under 10, ITP most often happens soon after recovering from a virus. She had H1N1 two weeks before, and we believe this was the trigger that began our most terrifying journey. For most children in this age group–80 percent–ITP goes away on its own within six months. E unfortunately has fallen into the 20 percent category of children who have chronic ITP, which means it may or may not go away, or it may go into remission only to return to her later in life (in particular, for girls with ITP menstruation and pregnancy can trigger a recurrence.) Every ITP case is different; there is no set pattern. Time will tell.